Lily Rose Kosmicki, Librarian at the Sam Gary Branch of the Denver Public Library. At The Urban Farm’s (TUF) annual Farm Fest, Sam Gary librarian Lily Rose Kosmicki reads a story as a goat tries to eat the sign. On Saturday, September 23, 350 visitors joined in festivities that included petting and grooming numerous farm animals, farm-related crafts and activities, music and food. 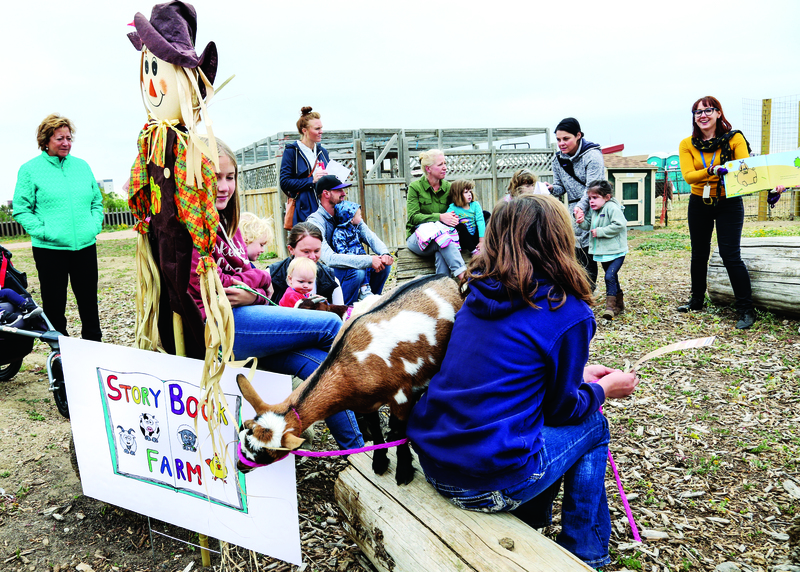 The event raised almost $3,000 that will go toward fitting out the interior of the farm’s new Gompers Greenhouse (named for the major donor). Harold Skramstad, TUF’s board president, says they need an additional $15,000 for doors, heating, plumbing, and fixturing that will give them a year-round growing space—and a teaching space for field trips and other classes at the farm. The Urban Farm is located at 10200 Smith Rd., Denver. They can be reached at 303-307-9332 or visit, www.theurbanfarm.org.